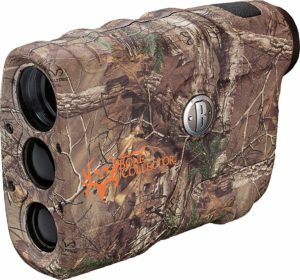 It’s not often that you find a product that offers so much while still costing less than the majority of its competitors, but the Bushnell 202208 Bone Collector Edition is great proof that good deals like that definitely exist out there. Don’t be fooled by the price tag if you’re in the market for something a little more advanced – you may find that this device covers all your bases and even goes beyond that. It’s accurate at differences of up to one yard, and it’s really simple to use with a one-click mode of action. The interface doesn’t show any advanced information, but at the same time it’s very clean and streamlined, making this the perfect device for those who regularly need to take quick measurements and want to be sure that they’ll have all relevant information right in front of them. While the built-in optical zoom is nothing special – going up to 4x – it should still work fine for the needs of most hunters, and the visibility provided by the device is clear enough to allow you to easily get your bearings in even some more difficult environments. Those who’ve used a Bushnell product before should know what to expect in terms of physical build quality, but for the others – this is a premium product made from durable, high-end materials. It’s built to last, not just in the long term but in the everyday sense as well, as the case is not only hard and resistant to hits, but it’s also weather-resistant and the device is fully operational in rain. Of course, this doesn’t mean that you can use it in more extreme environments like underwater, but for those looking to get a few good shots out on a stormy day, this is the best hunting rangefinder on the market. And no matter the weather, it won’t give away your position thanks to the stealthy camouflage design of its paint job. Everything you’d expect is included in the box, with a carrying case topping off the great package. The 202208 bone Collector is one of the most solid investments you can find if you’re looking for an everyday rangefinder, and this is a purchase you cannot regret.